Earlier this week, I wrote about the Minnesota State Bar Association’s decision to switch back to Fastcase as a member legal-research benefit, just six months after leaving Fastcase for Casemaker. Although I had reached out to Casemaker for comment, I did not hear back from the company until after I published that post. Yesterday, I had the opportunity to discuss the Minnesota situation with David Harriman, Casemaker’s CEO; Jim Corbett, director of business development; and Linda Franklin, director of client relations. Most of the comments were provided by Corbett. The reason the bar chose to switch to Casemaker in the first place was that it is in fact a superior research platform. Member dissatisfaction with Casemaker resulted from circumstances and misunderstandings unrelated to the core Casemaker service or platform. Let me expand on each of those points. Corbett started off by saying that there were compelling reasons why the Minnesota bar made the switch last June from Fastcase to Casemaker. Before making the switch, the bar appointed a study committee and went through a rigorous evaluation process. At the end of the process, Corbett said, the bar chose Casemaker for several reasons. 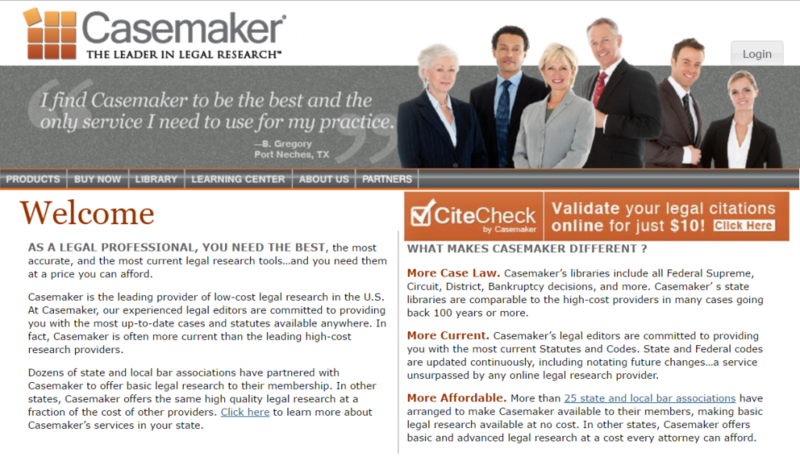 Another key reason the bar chose Casemaker, Corbett said, is that the statutes and administrative codes it provides are “bar none the most current of any online, including Westlaw and Lexis.” Casemaker’s CEO Harriman was formerly president of The Michie Company, and when LexisNexis acquired Michie, Casemaker hired its statute editors. These editors track all 50 state legislatures and the U.S. Congress and, as bills are enacted, they typically get them online within four days. Historically, Corbett says, Fastcase updated its codes only once a year. Still another reason, Corbett said, was the Casemaker Digest, its service for keeping subscribers up to date on case law developments of interest to their practice areas. Prior to switching to Casemaker, the Minnesota bar was producing its own update service for members. Part of its reason for switching was replace its service with Casemaker’s and thereby free up staff time for other purposes. User interface. “To a man, everybody on the evaluation committee agreed the Casemaker interface was far easier and more intuitive than the Fastcase interface,” Corbett says. When Casemaker learned that the bar had decided to switch back to Fastcase, “we were disappointed,” Corbett said. He attributes the decision to two circumstances that arose after the bar implemented the Casemaker service in June. The first had to do with the digest service. To operate the digest service in the way that the bar envisioned, Casemaker had to make several adjustments to its existing service, Corbett said. Before it was done making those adjustments and before the service was ready, the bar released the service to its members. As a result, Corbett said, it did not work well and caused a lot of frustration among the members who were using the digest service. Members began to complain about the service and say that they wanted to go back to the digest reports that Fastcase had been providing, not realizing that it had been the bar, not Fastcase, previously providing the service. Casemaker continued to work on improving the digest product and was finally ready to roll out the improved version when the bar announced its return to Fastcase. The other circumstance related to the organization of the Minnesota bar. The bar’s CLE arm, Minnesota CLE, is a separate non-profit corporation from the bar itself. In other states where Casemaker is a member benefit, it works with the bars to provide extensive member training programs, Corbett said. But because of the separation between the bar and its CLE entity, Minnesota never gave Casemaker the opportunity to provide such training. “We weren’t able to show people the advantages that Casemaker has over Fastcase,” he said.